The Manti Te'o Story: Why The News Media Let Its Guard Down The media lionized the football star amid stories of his perseverance after the death of his girlfriend. Now the girlfriend's existence has been called into question, casting an unflattering light on the practices of the media. Notre Dame linebacker Manti Te'o speaks Nov. 29 after he received a sportsmanship award from the Awards and Recognition Association in South Bend, Ind. One of the top collegiate football players in the country, Notre Dame's Manti Te'o, was lionized by the media amid stories of his perseverance on the field after both his grandmother and his girlfriend died. Thanks to an expose by Deadspin, the girlfriend's very existence is now believed to be a hoax, throwing the Heisman runner-up and his university on the defensive. But the episode casts an equally unflattering light on the practices of the news media. Te'o's story proved irresistible for the press — a saga of tragic romance, religious faith and athletic prowess that inspired an entire team to victory and a slew of news outlets to document Notre Dame's unexpected resurgence. This celebratory coverage ensued despite the fact that at least two reporters found a dead end when they sought to affirm details of the life of Lennay Kekua, the girlfriend. "It's a great lesson for me, for anyone who's a journalist, to keep being skeptical, even in stories that are not at the start inherently ones that make you skeptical," said Pete Thamel of Sports Illustrated in an NPR phone interview Thursday night. Thamel pumped up the pathos in a cover story last fall as he wrote of the girlfriend's brother Koa (also presumably fictitious) sobbing as he called to break the news of her death. But Thamel wasn't the only one to do so. The South Bend Tribune weighed in with a particularly florid account of Te'o's first encounter with Kekua, said to be a Stanford student, after a game. Te'o now says he only spoke to the young woman online and by phone. The truth is that much of the time, reporters are just like everyone else: They largely believe what they read in the papers and see on TV. So each successive journalist unconsciously relied on the last for confidence in what he or she was presenting to the public. And this story was one they wanted to believe. "There's no more heroes anymore — if there ever were," Thamel said. That's what sports has taught us — Lance [Armstrong], Barry Bonds, all of these guys." For what it's worth, Thamel spent four days on Notre Dame's campus conducting interviews and still believes that Te'o believed in Kekua and his online and telephone relationship. 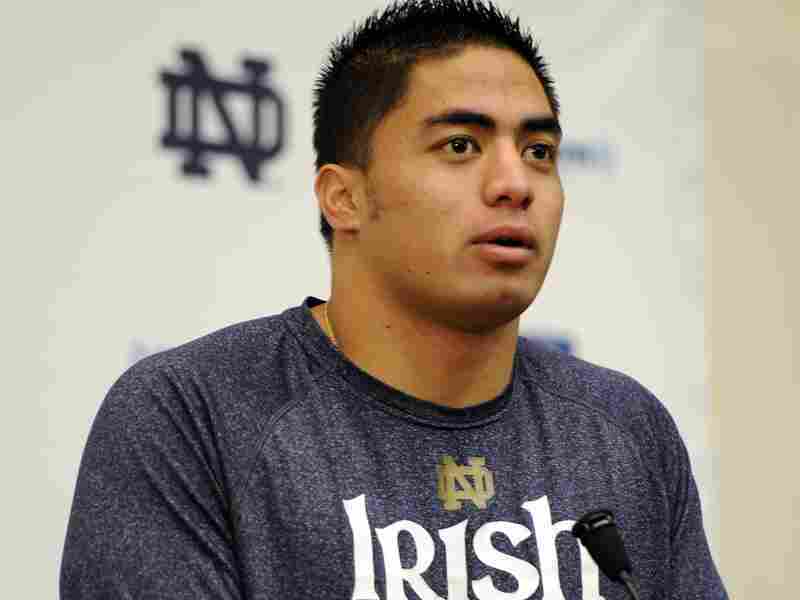 Te'o and Notre Dame assert that he was the victim of an ongoing and cruel hoax, though the university's timeline shows the player to have spoken of losing her even after having learned of being deceived. It is an accident of the calendar that the confession of disgraced cycling champion Lance Armstrong arrives the same week as the revelations about Te'o's purported girlfriend. The mainstream media celebrated Armstrong despite his unfathomable performance, the critical reporting of a critical mass within the sporting press, and the mounting allegations of his former teammates and colleagues. But the need to have a story to tell trumped all of that. "It's this mythic, perfect story that was not true," Armstrong told Oprah Winfrey on Thursday night. "All the fault and all the blame falls on me — but behind that picture and behind that story is momentum. And whether it's fans, or whether it's the media, it just gets going. And I lost myself in that." In the case of Te'o, he spoke intensely about the loss of his girlfriend, who urged him on at every stage, even as she convalesced from a car accident and then treatment for leukemia. The media could not help itself. CBS's Chip Reid filed his version earlier this month from Hawaii, where he was covering a vacationing President Obama. Reid interviewed Te'o's neighbor and a high school coach there — and relied on clips of Te'o from an interview with a fellow Notre Dame graduate who is an anchor at the CBS station in Chicago. Thursday, Reid revisited his piece on CBS This Morning: "It turned out, we were all duped." Reid was right: they were duped. But Reid talked as though he had been a bystander to an unfolding disaster. That's not how reporters typically think of themselves. They envision themselves as a hard-boiled lot that warns each new crop of interns: If your mother says she loves you, get a second source. And yet little of that happened here. Instead, reporters left their skepticism at the door. "I sat across from him, and I was moved by his story," ESPN's Gene Wojciechowski said on the network Wednesday night. "It was heartbreaking and it was heartwarming, and as it turns out it was totally untrue. But short of asking to see a death certificate, I'm not sure what most people would do differently in that case." CBS's Charlie Rose pressed Reid on the reporting process Thursday morning, asking if the network had sought information directly from Notre Dame in its original reporting. "Oh, we did repeatedly, Charlie," Reid told Rose. "That weekend before the BCS game and before our story aired, we contacted them repeatedly for interviews with coaches or Te'o himself, and they never returned our calls." Great impulse, there, Charlie Rose. But why didn't some enterprising reporter call Stanford to verify Kekua's attendence and academic major? Even if one didn't doubt her existence, these are the small details and the color that help give texture to a story and make it feel solid. Why not check out local papers and records and hold off when you cannot pin down any details? As it happens, both Thamel and Wojciechowski said they tried — and failed — to do just that, coming up empty when they sought obituaries for Kekua. Thamel said she had made no footprint on the Nexis database of news reports and public records. And Thamel said he called a contact at Stanford, who told him she did not appear in a roster of people who had graduated. He said he removed the reference to being a Stanford graduate from his piece. But why not confirm with the university that she had been enrolled there? It was Sunday night, Thamel said, and his deadline loomed. "I know it sounds bizarre, but there was no compelling reason to doubt this girl's existence," Thamel said. Wojciechowski told his colleagues at ESPN that he had been rebuffed by Te'o when seeking phone numbers to call the girlfriend's relatives, saying the reporter should not intrude on their grief. "And so in that instance, and at that moment, you simply think that you have to respect those wishes," Wojciechowski said earlier this week. "But in retrospect, you can see where some of those things simply were not adding up to make sense." Here's an instance of at least two experienced reporters who tiptoed to the edge of the truth and didn't quite believe where their reporting took them. The story was too important to let the absence of verifying facts get in the way. Just like fans in the stands, the reporters and their peers wanted the story to be true.